Migraine patients are frequently told that their debilitating attacks are “inherited”, “genetic” or “hereditary”. 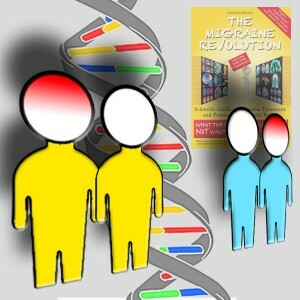 Yet, studies show that migraine is not a genetically pre-determined condition: Migraine is not “genetic”. Everybody knows that the color of one’s eyes is determined by inherited genes. Once the brown-eye gene has won the battle for the spot on the child’s chromosome, no amount of blueberries during pregnancy can change the offspring’s eye color from brown to blue. Hence, “inherited” means “untouchable” or “inescapable” to us. We also know that bad luck with genes and chromosomes can lead to a genetic condition like Down Syndrome. Therefore it is disheartening for migraineurs to learn that migraine too is part of our genetic destiny. However, studies show the opposite to be true. If the presence of migraine disorder were determined by our genes like our eye-color, then identical twins with identical genes would always be the same: They would either both have migraine or both be migraine-free. In genetic research this “sameness” of traits is called concordance and we would expect that the allegedly “genetic” migraine disorder shows concordance rates like Down Syndrome or eye color of 90 to 100%. Surprisingly, studies on identical twins with migraine show rather low concordance rates of about 40% only. That means, if one of two genetic twins has migraine, it is more likely that the other one is migraine-free than a migraine sufferer too. That proves that migraine is not a genetic condition like Down syndrome and migraine attacks are not pre-determined like brown eyes. The degree to which the genetic make-up contributes to the presence of migraine disorder varies considerably with a multitude of factors. The average heritability of migraine is about 45%. For comparison, the heritability of major depression or fatal heart attacks is 50% and that of obesity is 65%. None of these conditions are known for being “genetic” and “untouchable”. Obese people are encouraged to eat less and to exercise more, patients with a high risk for heart attacks are told to watch their lifestyle and diet and patients with major depression are advised to sort out their issues with a therapist. In contrast, migraine patients are instructed to manage their attacks with medication and to watch out for suspected trigger factors like cheese, red wine and chocolate. No more can be done since migraine is allegedly “genetic”. 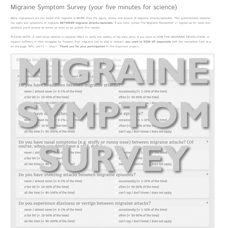 It is obvious who profits from misleading migraine patients into total reliance on medication. Migraine has become a very lucrative condition for the pharmaceutical industry and “genetically condemned” migraineurs are loyal customers.